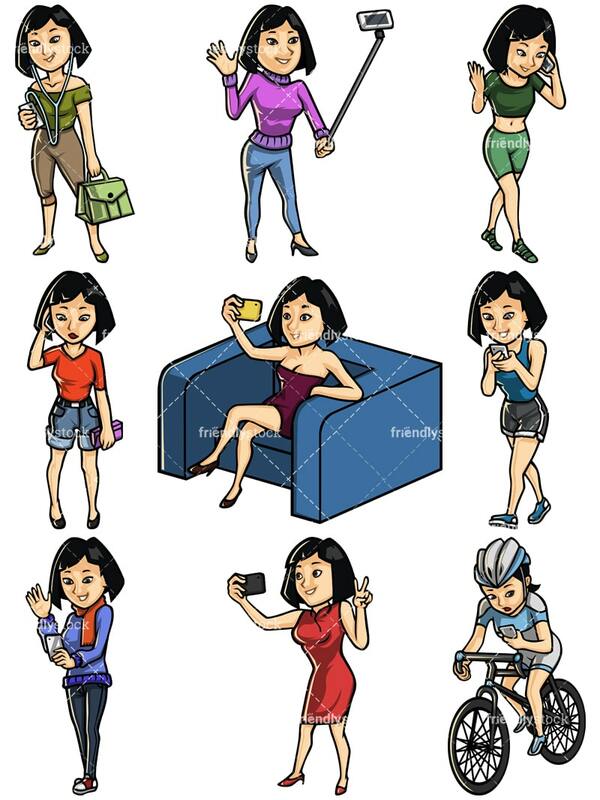 A collection of nine high-quality vector illustrations of a young woman with Asian characteristics using a modern cellphone in her every-day life. Royalty-free stock illustration of an Asian woman with dark straight hair dressed casually and smiling as she enjoys listening to music on her cellphone with earbuds. Royalty-free stock illustration of an Asian woman with dark straight hair talking on a cellphone while holding a purse and looking if she is paying close attention to the conversation. 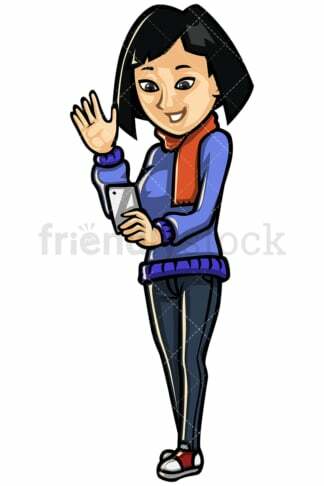 Royalty-free stock illustration of an Asian woman with dark straight hair video chatting with someone on her mobile phone and smiling as she waves hello. Royalty-free stock illustration of a careless black woman with dark straight hair typing on her cellphone while walking, smiling, and looking absorbed and distracted. What a dangerous situation! 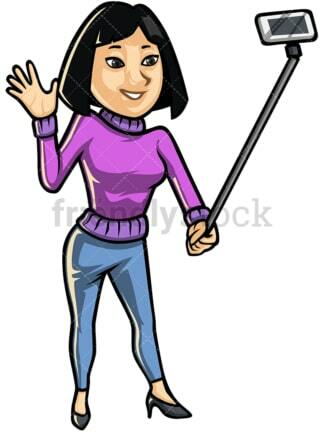 Royalty-free stock illustration of an Asian woman with dark straight hair smiling, waving, and taking a picture with her phone while doing so, using a selfie stick. 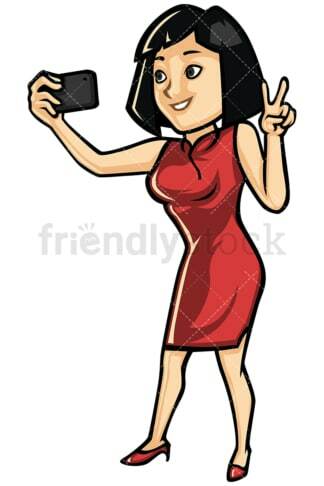 Royalty-free stock illustration of an Asian woman with dark straight hair smiling and making the peace signal gesture with her hand, taking a selfie with her cellphone while doing so. 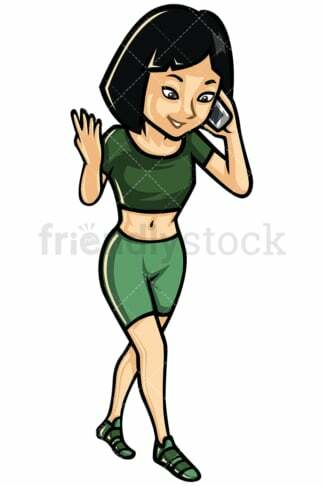 Royalty-free stock illustration of an Asian woman with dark straight hair talking on her cell phone while walking, smiling, and making a gesture with her hands as if she is making a point. Royalty-free stock illustration of an Asian woman with dark straight hair sitting on an armchair in her living room, smiling, and taking a selfie with her mobile phone. Royalty-free stock illustration of an Asian woman with dark straight hair carelessly using a mobile phone while riding a bike, either to check her messages, send an email, or check her social media profiles.